To the Batcave! 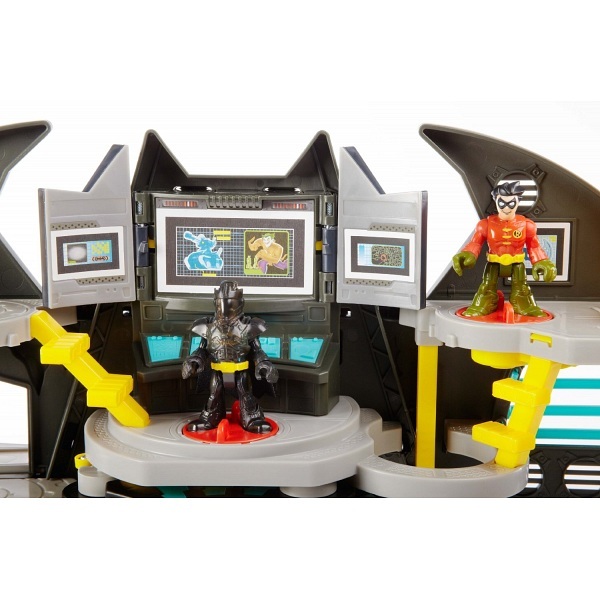 Kids can join the Caped Crusader and his sidekick Robin at their secret headquarters where they watch over Gotham City from their Batcomputer. 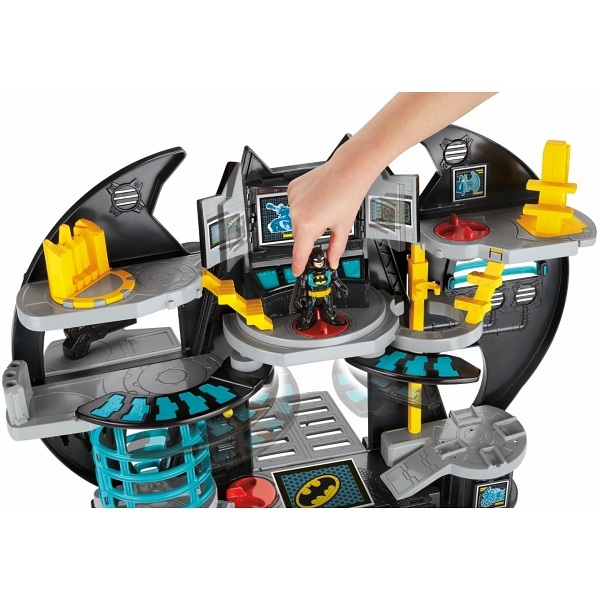 Turn the Batman or Robin figures on any of the 3 activation disks throughout the Batcave to make cool things happen. Enemy approaching? Flip down the projectile launcher platform, aim, and fire! And when the Batcomputer shows trouble in Gotham City just place Batman on his Batcycle and send him off to save the day! Have an iPhone? 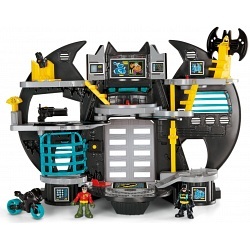 You can bring the Imaginext Batcave to life! 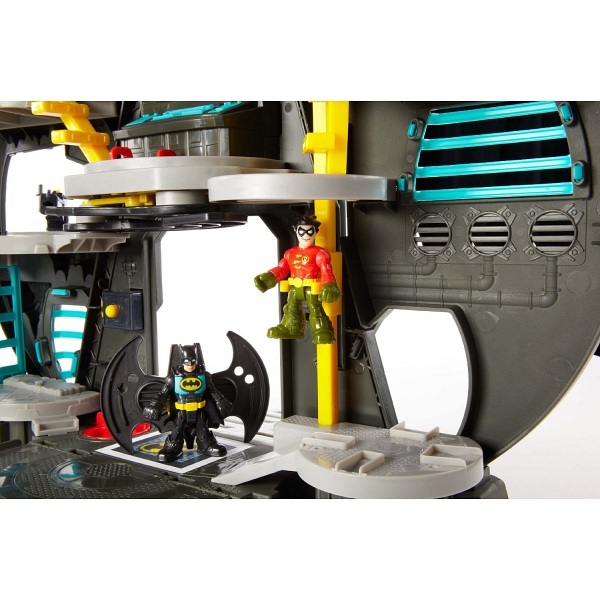 Download the free Imaginext Batcave app and bring it to this Batcave for interactive fun on your iPhone screen. 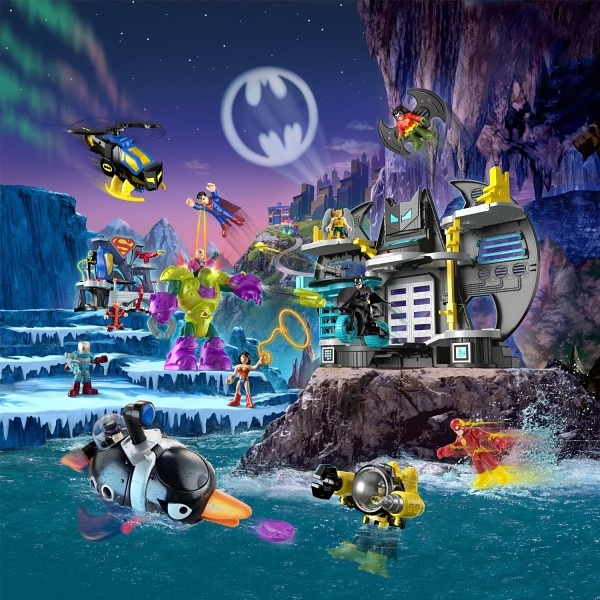 The Batcave is packed with action at every turn, and kids are the ones who make it happen. 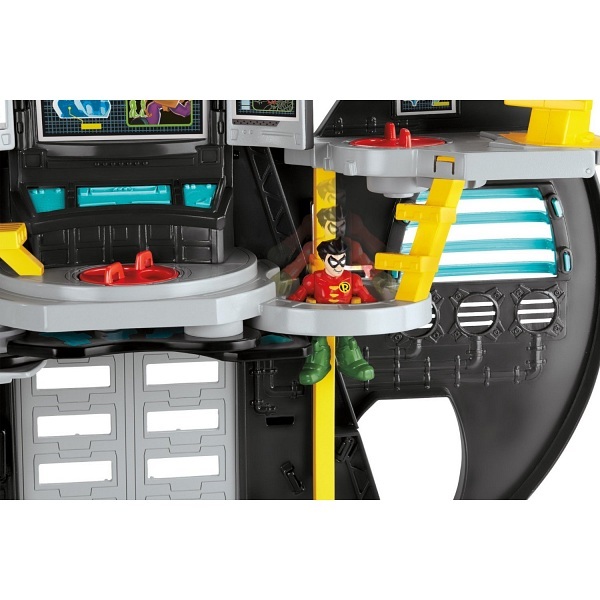 Turn a figure on the center disk and the Batcomputer pops open while the walkways extend. Head over to the launcher platform and press the button to fire projectiles at intruders! 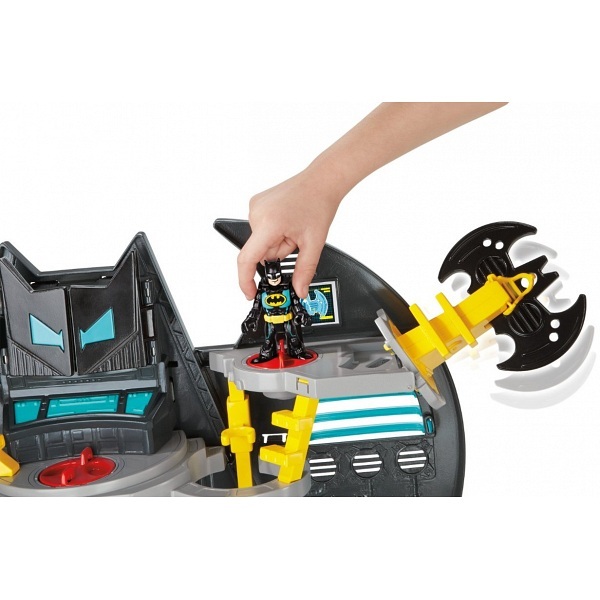 On a different disk, kids can turn a figure to pop up the Batwing! Clip a figure in to the elevator and move them down to the bottom level to access yet another disk that drops the front door when turned. The criminals have found us! Robin, arm the launcher! Children begin to create dialogue between the characters and vocalise the stories they are playing out. 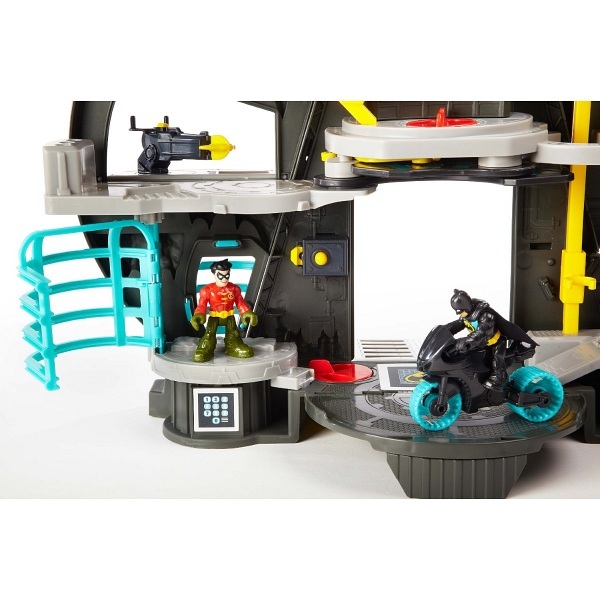 Plus, awesome accessories like the flight suit and Batcycle help kids recreate their favorite DC Super Hero adventures – or create new ones of their own. The Imaginext Batcave is our most wished for Christmas present or Christmas gift idea for children and kids this year 2013. 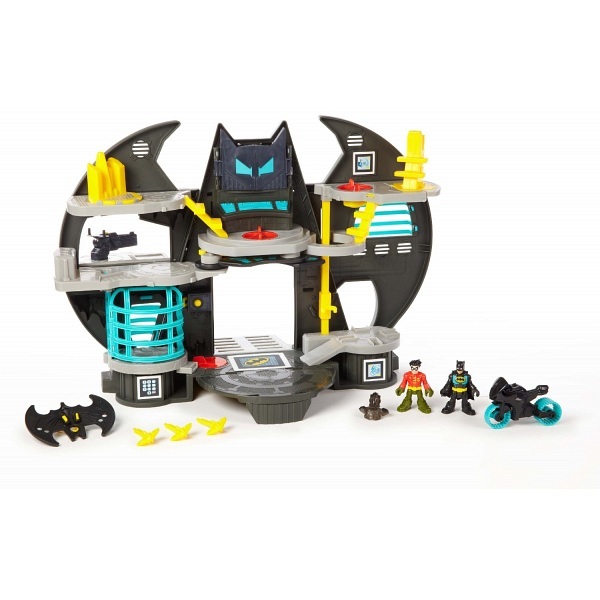 Most children already know about the Imaginext Bat Cave as they have seen the adverts which run daily on the Channel 5 Five Milkshake! show.